The thing about making light of a dark subject is that if you're going to do it, there needs to be a twist or nuance. The other thing is, if that dark subject is about some sort of assault, it's probably best to take aim at the perpetrators rather than their victims because, well, that would be gross. The thing about Roy testifying against his masseuse is that it does neither of these things. At first it just looks like this storyline is going to be another one of Roy's gay panic tantrums, when he gets antsy about a male masseuse going for the glutes. But the actual massage scene gets some traction from Roy giving up on caring because he really does love the massage…and then the male masseuse leans down and gives Roy's “arse” a cartoonish kiss. Since Roy spends the entire scene going back and forth on if he should be freaked out by just the fact of this male masseuse, the kiss actually manages to be an unexpected and perfectly funny button for the scene. But then Roy goes back to work, freaked out and on edge, and things take a turn for the strained. As Roy tells Moss the story, we’re meant to believe that Moss is going to laugh, but Moss just stares at him and spits, “And you thought I’d find that funny?” The studio audience’s confusion is understandable. Richard Ayoade plays Moss' unblinking indignation with exactly the right amount of grim determination that the script requires, but Moss really does sound sarcastic, like he's going to turn and laugh at any moment. As the scene goes on, and on, and on, it becomes less and less effective, namely because it betrays just how lazy the entire joke premise is. See, they're having a conversation about Roy getting sexually harassed, but it's funny because the guy kissed him on the arse, which is a funny word, so therefore, the runner is hilarious. It occurred to me when I was re-watching that this could be Linehan's take on a traditional Law and Order: SVU type scenario, but if that was the intention, it's hardly clear. This goes double for the subsequent courtroom scene. We know where it's going from the start, but there's very little pleasure in watching it unfold. Again, it's not that sexual assault is or should be off limits for comedy, period; it's that having the comedy depend on just swapping out the details for some silly strings of words comes off as lazy at best. There are no real jokes here. And finally, Douglas explores "Spaceology," a thinly-veiled parody of Scientology that delights in stringing together nonsense words and tacky presentation videos, but which never quite comes together. Spaceology also makes it clearer than ever that Douglas really has to strain sometimes to be involved in IT affairs if he isn't sexually harassing Jen. It's almost a joke in an of itself when he pops into the office just to tell them that he believes in Spaceology/gave himself a tattoo/had to get his hand amputated/finally got that bionic hand that he's always wanted. At the very least, Douglas becomes a non sequitur in an episode already overflowing with them. None of these pieces really go together, but more importantly, neither do they stand up on their own. Writing these reviews two at a time has been an interesting practice, not just because it's twice the work, but because sometimes a double-shot of episodes reveals parallels or themes that I missed the first time around. (Also, who watches only one episode of anything in this brave new world of binge-watching, am I right?) But this week's twofer was particularly great, if only because the superb "Italian for Beginners" made getting the bad taste of "Something Happened" out of my mouth much easier. Meanwhile, Roy is in the honeymoon stage of a relationship with a very pretty woman. Their opening montage of relationship bliss mirrors Jen’s in “Something Happened,” as they smile and laugh and go into photo booths and toss their hair at each other while whirling around a playground (is that a seesaw? A merry-go-round? A whirligig? Please leave your theories in the comments, because I am stumped). But since what goes up must come down, the honeymoon starts to fizzle out once Roy hears the story of how his new girlfriend’s parents died. See, Julia’s parents died in a fire…at a Sea Parks. There was a sea lion show, and the flames were all around them, but she doesn’t want to talk about it anymore so that’s all Roy will get. Ever. It only takes the slightest twitch in the corner of Roy’s eye to know that we are in for a Grade A Roy meltdown, and it is going to be spectacular. The pacing of Roy’s spiral into madness over this story is practically perfect. First, he tries to get more details from Julia, only to hear what her angry Darth Vader voice sounds like. Then he goes back to the I.T. department and tells the story to Jen and Moss, watching them closely over his coffee cup to make sure that his incredulous reaction isn’t an outlier. Sure enough, Jen and Moss are just as confused as he is, and the hesitant, confused back and forth between the three of them is a beautiful thing to behold. “Sea Parks?” Moss asks. “Huh.” Then some nodding. Then a few moments of, “is it insensitive if I keep pushing this?”, some inquiries as to whether this Sea Parks has as much water for the whales as one would expect. Then, finally, Jen gives Roy the opening he needs to be as freaked out as he wants to be when she says, “it just seems like a weird place to go on fire.” And we’re off. “A fire? At a Sea Parks?! It’s the weirdest thing I’ve ever heard!” Roy bursts. “If she had said her parents had drowned, I’d be the happiest man in the world.” And you believe him. As he squirrels deeper and deeper into his obsession, he focuses on weirder and weirder details (“It has twelve exits”), and it gets funnier and funnier. This is a prime example of how repetition can work, but how it needs new details to keep it fresh. It needs to escalate, as it does when Roy ends up building a Sea Parks out of his mashed potatoes Close Encounters of the Third Kind-style, then a to scale miniature model that he then sets on fire to see how such a thing could possibly happen. 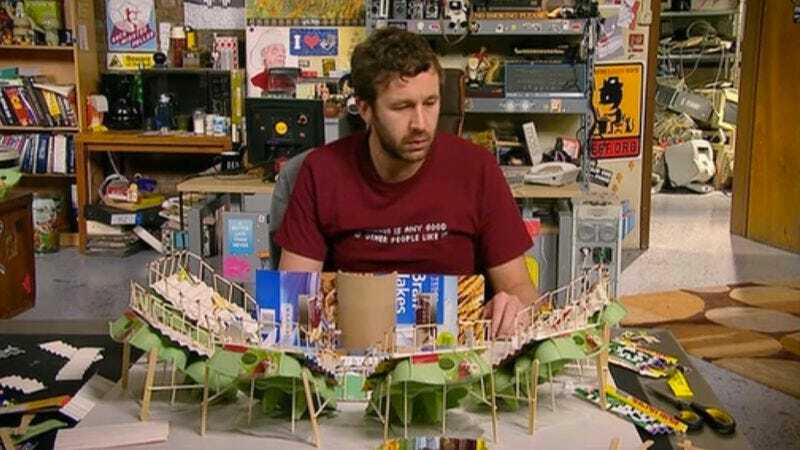 Also, every week I think I've found the most satisfying phrase O'Dowd said on The IT Crowd, and every week I choose a new favorite, but there really is no beating his constant and incredulous, "Sea Parks?!" Let’s see, was there anything else…? Oh right, Moss gets stuck in an arcade game because he saw a stray iPhone. As he tells Jen through the Plexiglas, he’d get an iPhone without giving any money to Apple, or as it’s more commonly known in geek circles, he’d be living the dream! It’s another very silly runner for Moss, who’s increasingly become the most cartoonish character of the basement, but Linehan still ties it into Jen’s storyline and gives the situation some real stakes. Did it need a scene where Moss pushes the iPhone out of the machine and into Jen’s waiting arms like he was giving birth? Probably not. But at this point, we really shouldn’t expect any less from this show. This week’s very silly but very fun details: Moss’ supply of popcorn for particularly interesting stories, Jen’s work rival doing a virtual triathlon. “Haven’t you just had a baby?” “So they tell me.” Jen’s work rival is my hero. You know the Sea Parks obsession has gotten bad when Julia catches Roy looking it up on the computer and his cover story is that he’s been masturbating. Roy’s fictional sea lions are named Luigi, Joe, and Slippery Pete. Just FYI. Next week: The End of the series, at least until they turn it on again with this fall's one-off special.